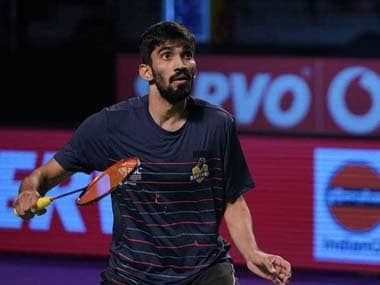 Mumbai Rockets ended the title defence of Hyderabad Hunters to set up a summit clash against Bengaluru Raptors at the Premier Badminton League Season 4 on Saturday. Mumbai's trump Sameer Verma played a brilliant match before Anders Antonsen finished off what was a dominant 4-2 win for the two-time runners-up at the Kanteerava Indoor Stadium. Sameer Verma in action in the PBL semi-final. The Rockets looked the better of the two teams for most part of the tie, racing ahead to 4-0 before PV Sindhu could finally open the Hunters' account. It was, however, only a matter of time before Mumbai wrapped it up. The superb Sameer was not bothered by the fact that he had lost his last BWF showdown to World No 35 Mark Caljouw. Asserting his supremacy right from the start, the Mumbai shuttler raced ahead to 8-2 before the Dutchman could not even settle into the match. Staying very calm, Verma grabbed the first game 15-8. Sameer smartly blunted Caljouw's aggression even in the second game to move ahead to 8-2. Using his deception to perfection, Verma wrapped it up 15-8, 15-7. Hyderabad's Lee Hyun Il was able to stave off a resilient Antonsen to go up to 8-6 in the fourth rubber. Despite Lee going up to 13-11, the young Dane looked unfazed and steadily fought back to take the opener 15-13. Antonsen did not have to work as hard in the one-sided second game. He held control of the proceedings throughout the game, building an 11-6 advantage before finishing off a 15-13, 15-6 victory that sealed the tie. World No 3 Sindhu was the lone bright spot for Hyderabad. She was always a tall order for the 202nd ranked Shreyanshi Pardeshi of the Mumbai Rockets. Even though Sindhu did secure a 15-6, 15-5 win, the rising star did have her moments. Her net game did trouble the lanky Sindhu to a certain extent in the first game and she managed to trail her highly accomplished opponent by just one point at 7-8. However, once Sindhu upped the intensity in her attack, it became an uphill task for Pardeshi. Over hitting under pressure did not help her cause at all as Sindhu opened up a 7-0 lead in the second game. It was all too one-sided after that as Sindhu cantered to an easy win. Earlier, Lee Yong Dae and Kim Gi Jung gave Mumbai a dream start with a 15-14, 15-12 win over Hyderabad's Bodin Isara and Kim Sa-Rang. While the first game remained highly competitive, the second game was in the grip of the Hyderabad duo for a long time. Bodin and Kim led till 8-5 in the second game but could not prevent the Mumbai duo from making a strong comeback to go up to 13-11 before they closed out the win.